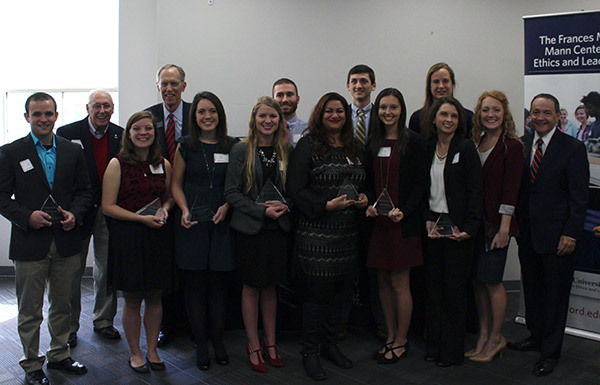 Samford University’s Frances Marlin Mann Center for Ethics and Leadership presented its 5th annual Leadership and Character Awards at a Nov. 11 ceremony. Students were nominated from each of Samford’s 10 academic schools by the deans, and one student- athlete was nominated by the athletics director. These 11 Samford students were chosen as tops in their respective schools in combined academics, positive character, ethical leadership and service to others. Nabers also acknowledged the family members in the audience and others who had been instrumental in laying ethical foundations for the students who were being awarded. Claire Wells (School of the Arts), senior theatre for youth major from Montgomery. Smith earned the additional honor of the Mann Center’s Joe McDade Scholarship, which carries a one-time gift of $3,500. The ideal nominee for the Joe McDade Scholarship demonstrates a life and character lived in the spirit of Christ; a contribution to the overall betterment and wellbeing of the university; participation in a wide range of campus life; leadership ability; an embodiment of the overall goals, mission, and spirit of the university; and commitment to the long-range development and wellbeing of the university. Funding for the scholarship came from 1961 graduate Joe McDade.